Hello, sweet friends…happy Friday! Sweet 'n Sassy Stamps is releasing a new Lovin' God's Word Kit today which will be available for a limited time. The bundle includes two brand new Bible Journaling stamp sets designed by Krista Hamrick, a book mark designed by Rebecca Rios, and a few other crafty goodies. This bundle will be available at a discount for only two weeks until Thursday February 11th. After that, the stamp sets will be sold separately at the Sweet 'n Sassy Stamps Store at the regular price. 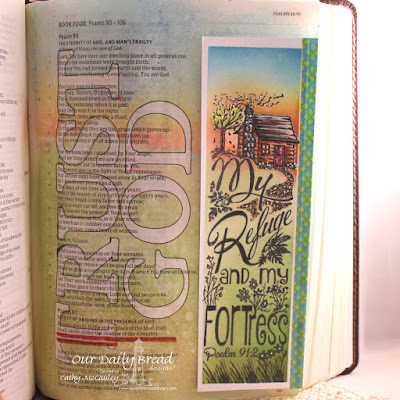 The Design Divas have been busy making fabulous samples with the products in the Lovin' God's Word Kit to inspire you, AND you will see that these stamps can be used for so much more than Bible Journaling! Just think of all the ways you can use those adorable banners! Creative Nugget: The bookmarks were watercolored using SU! markers. 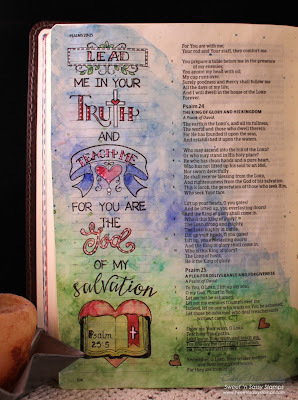 The Bible journal page was prepped with TriArt clear gesso and watercolored with Kuretake watercolors. Markers and a white paint pen were used to add details. Be sure to click on the thumbnails below to see more fabulous ideas for this amazing Lovin' God's Word Kit! Hello everyone! Hope you are having a great week. The roads are finally getting cleared off and kids will be heading back to school today which means DH will be heading back to work as well. I've been enjoying my "Snowed-In" days! I have two Splitcoast Challenge card to share…first up is Believe using Sketch #577 for today. Creative Nugget: I haven't used this watercolor technique in ages…simply color directly on the stamp with markers, give a quick spritz of water and stamp. Colors were chosen to match the Penny Black designer paper. SU! markers were used on the pretty flower images in the Nature Silhouettes stamp set by Sweet 'n Sassy Stamps. 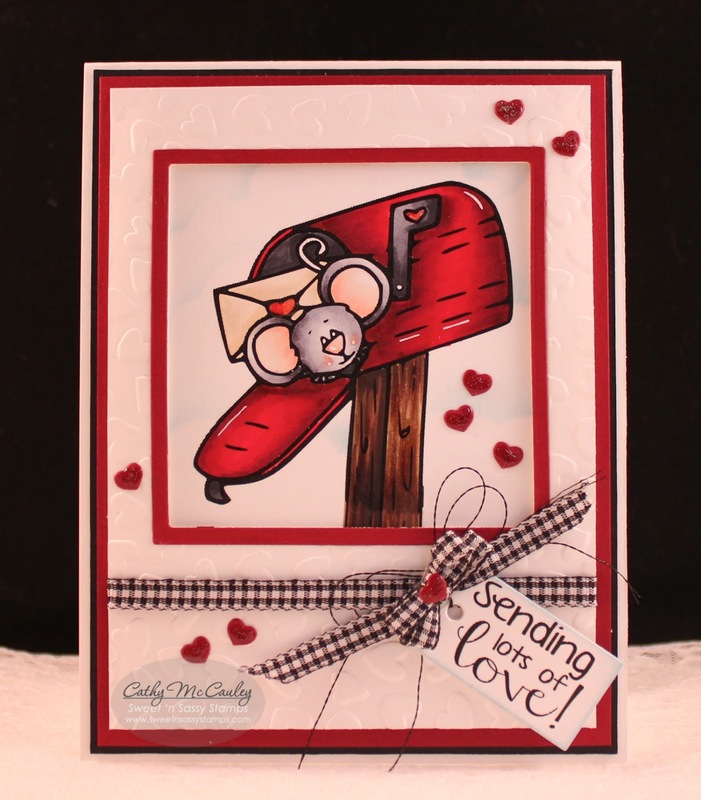 The popped up sentiment comes from the Words of Faith Collection 1 stamp set which is part of the Creative Worship brand of stamps being launched by Sweet 'n Sassy Stamps this Friday! 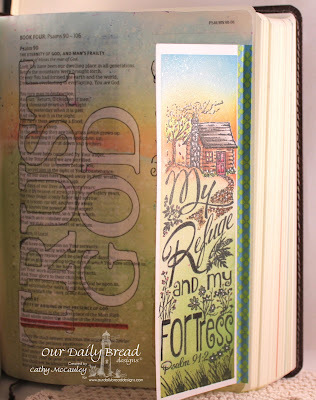 Bible Journaling stamps are also perfect for card making! Love that pop of pink! Creative Nugget: A stencil was used to emboss the fun design on the background. While the stencil was still in place, colorful distress inks were sponged onto the design. Don't you love those pops of color! 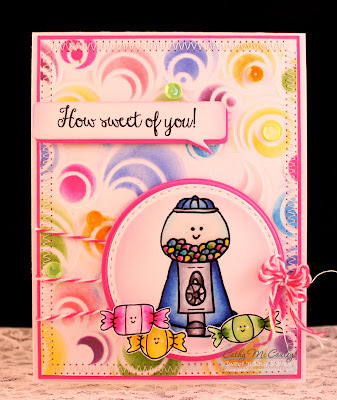 The candies and gumball machine are part of the Sweet as Candy Digital Stamp Set and the sentiment is from Candy Sentiments 2. A few colorful sequins finish off the card. Thanks so much for stopping by…Believe in the one who made this day for you to enjoy! Hello friends! Hope you are staying warm and safe where you are. I'm taking advantage of being snowed in to finish a few challenge projects. 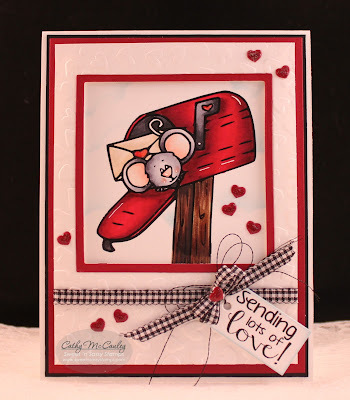 Creative Nugget: Today's Featured Stamper on Splitcoaststampers is Michele Greenwood. I was intrigued by the layout on her Gold Hello card, so used it to inspire this birthday card which will be given to my SIL. 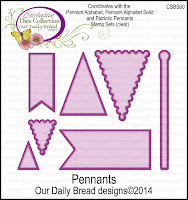 Old papers and dies as well as new stamps and dies from Our Daily Bread Designs were used on my card. Strips of Shabby Rose papers were stitched to a piece of TH Craft Core Metallic card stock to form the base of the card. 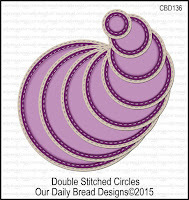 Double Stitched Circle Dies were used for the circle elements. 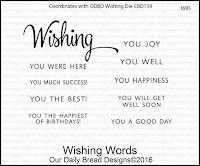 A sentiment from the Wishing Words stamp set was white embossed on a vellum circle and layered on top of the DP. 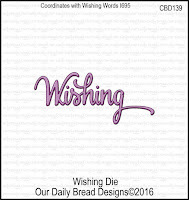 The Wishing Die was used to cut "Wishing" out of silver card stock. 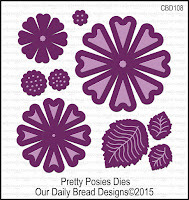 Flowers and foliage were cut with the Pretty Posies Dies and the Fancy Foliage Die. A ribbon and a few pearls were added as finishing touches. Thanks so much for stopping by…have a blessed Sunday! 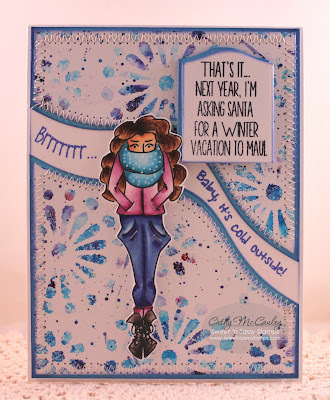 Creative Nugget: The background for this card was made by sprinkling Color Burst pigments through a stencil and spritzing them with water…what a splash of color. More splatters were added to fill in some of the white space. The curvy edges were cut with one of the Hillside Edges Dies. 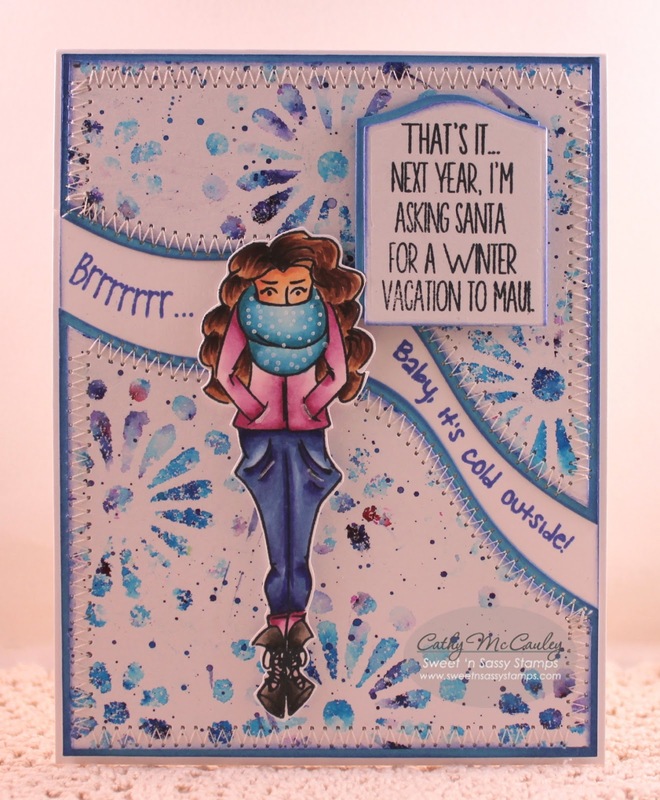 Winnie was colored with Copics and is from a cute stamp set by Sweet 'n Sassy Stamps called Winter With Winnie. 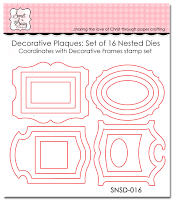 The fun sentiment was cut with one of the Decorative Plaques Dies. A past sketch by CAS(E) This Sketch was used for the design. Whether you love snow or not, have a wonderful weekend. Be safe and stay warm! Hello dear friends! It's been a long time since Sweet 'n Sassy Stamps has released a new Digi, but today, 21 new digi stamps have been added to the Sweet 'n Sassy Stamps Store…and are they ever fun to work with and soooo adorable! I am thrilled that one of the new images is Cocoa! That's right...a new Cocoa Digi just in time to send love to a special someone, not only on Valentine's Day but all throughout the year. Creative Nugget: The Cocoa image was printed on Neenah Solar Crest card stock and colored with Copic markers. Some hearts were embossed on the frame and the little red hearts sprinkled on the card are from the Hearts Scallop Border Die. The sentiment was cut with a Mini Tags Die and tied onto the card with a bit of metallic thread and some gingham. Who doesn't LOVE candy? These candy images are sure to brighten up your day, bring a smile to your face, and give you a craving for a sweet treat! Creative Nugget: The advantage of digi images is that they can be sized and moved however you want. 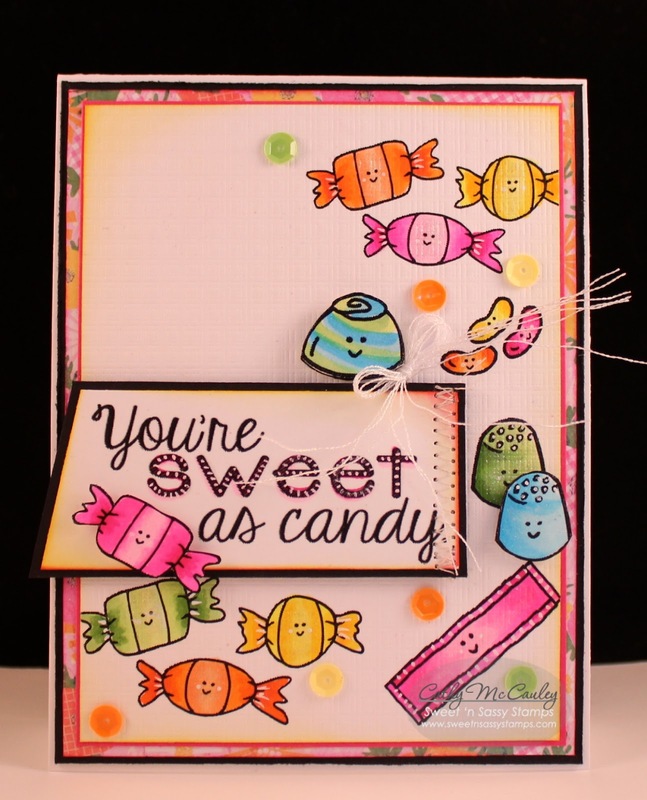 These sweet pieces of candy were sized and moved to cascade down the card front, colored with Copic Markers, and given some sparkle with a Wink of Stella marker. 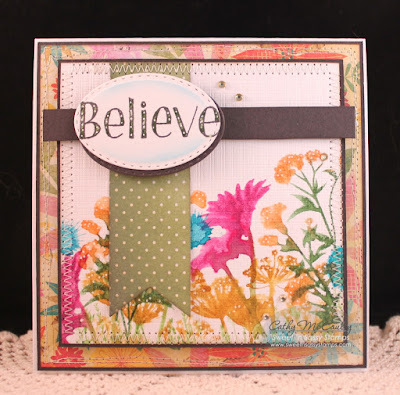 Some of the pieces were popped up for a bit of dimension and a sentiment was stitched on to finish the card. Now isn't that SWEET? To see all of the new images, just pop on over to the "see what's new" section of the Sweet 'n Sassy Stamps Store. 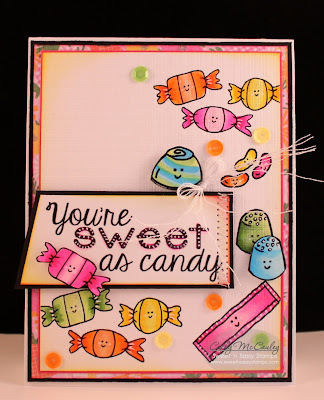 For more samples made with some of the other new Digis being released, hop on over to the Sweet 'n Sassy Stamps Blog. Thanks so much for joining me…hope your day is as sweet as candy! Welcome, my friends! 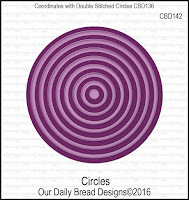 Today we are taking a look back at Our Daily Bread Designs January 2016 Release. 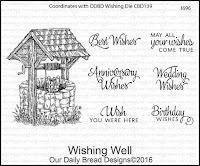 The new Wishing Well stamp set with the coordinating Wishing Words set and Wishing Die are so versatile and perfect for many occasions throughout the year. My sample today could be used for a wedding or anniversary. Creative Nugget: The design for my card was inspired by the Mojo Monday Sketch for this week. 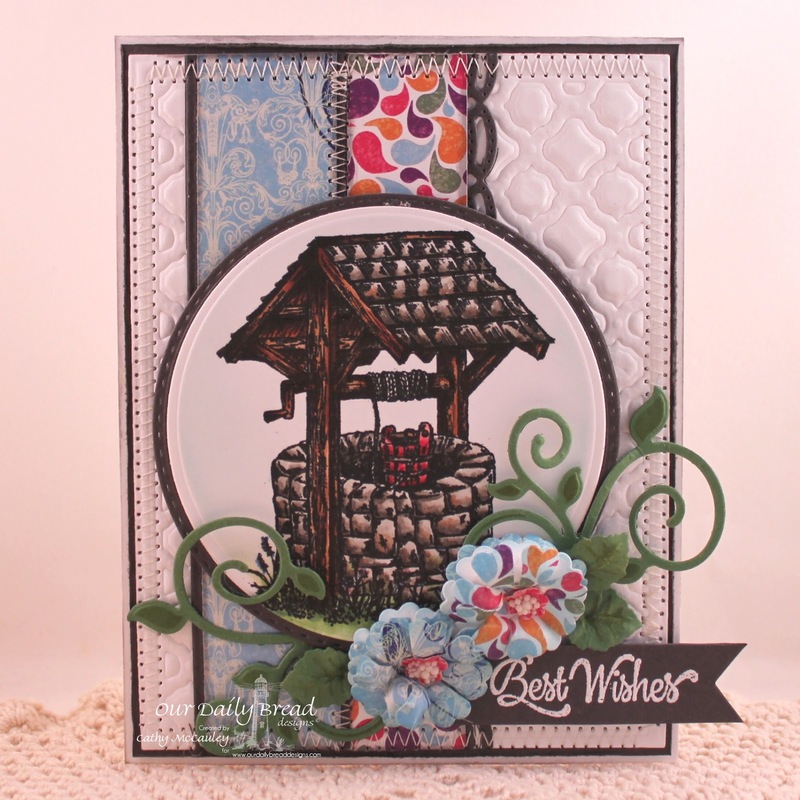 The Wishing Well was colored with Copic Markers, cut with one of the Layered Lacey Square Dies, and sponged while still in the die. A craft knife was used to cut a slit in the top of the hearts on the Heart and Soul Paper so the Wishing Well panel could be tucked behind the hearts. The Boho Background Die was used to emboss the Double Stitched Circle die cut that was also tucked behind the image panel. A sentiment from the Wishing Words set was combined with the Wishing Die to send happy wishes for a special couple. A little stitching and a metallic thread bow were added to finish the card. Robin T. * Dawn * Robin C.
Creative Nugget: This old My Mind's Eye DP from my stash had a lot of butterflies, so I began with that. The Leafy Flourish Background stamp from SNSS was clear embossed over the butterflies. The circle element was sponged and stamped with images from the Nature Silhouettes and Nature Silhouettes 2 stamp sets, also by SNSS. 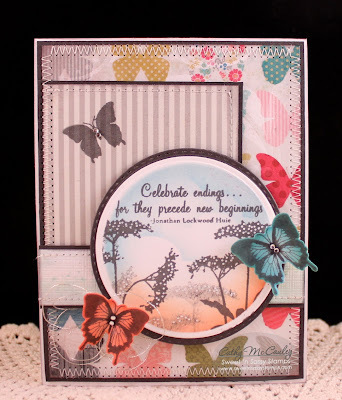 The butterflies were die cut and stamped along with the sentiment from the New Beginnings stamp set. The design for my card came from this week's Mojo Monday sketch. Hello friends! 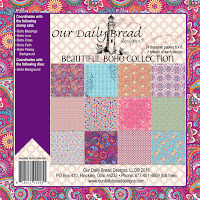 Happy New Year and welcome to the Our Daily Bread Designs January 2016 Release! Did I just say 2016? Where did 2015 go? 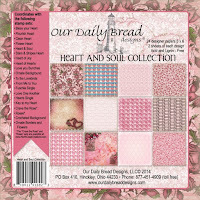 Our Daily Bread Designs is releasing several new Bible Journaling stamp sets, two new all occasion stamp sets, and two new die sets this month. 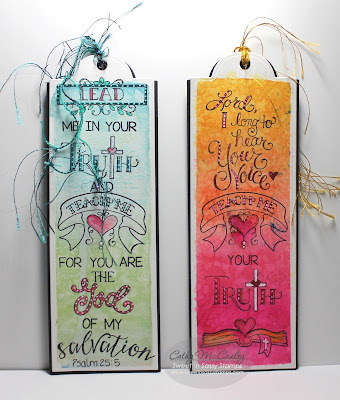 If you haven't jumped into Bible journaling yet, these sets are also perfect for bookmarks and cards. Wait until you see what the talented Breadstick Designers have done with the products from this release! Three randomly selected winners will each receive a $25 gift certificate to the ODBD Store to be used toward the purchase of ODBD Stamps found in the "stamps column" of the website just for commenting on the Design Team cards! You have until January 2, 2016 at 9:00 p.m. EDT to leave your comments on the Designers' Blogs for a chance to win! The Winners will be posted on the ODBD Blog on January 3rd, so be sure to check back there to see if you won! Creative Nugget: Beautiful Boho Papers were stitched to an embossed Boho Background to create the front of my card. A Beautiful Border die cut was also tucked into the right edge of the designer paper strips. The Wishing Well image, colored with Copic Markers, and gray the mat were cut with the new Circle and Double Stitched Circle Dies. 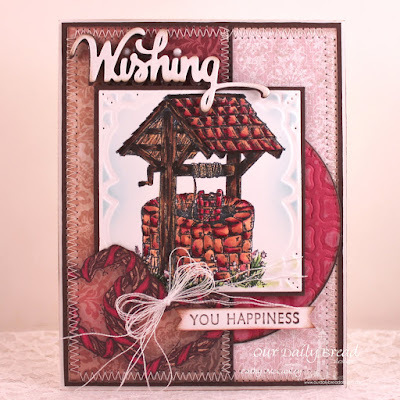 One of the sentiments from the Wishing Well stamp set was white embossed on gray card stock and the end cut with a Pennant Die. 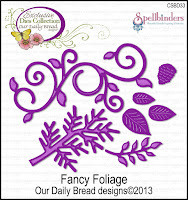 The floral embellishment was made with the Pretty Posies Dies and the Fancy Foliage Dies. A few Prills were added to the center of the flowers to finish the card. My next sample is a Bible Journaling page made with one of the new Bible Journaling stamp sets, My Refuge. 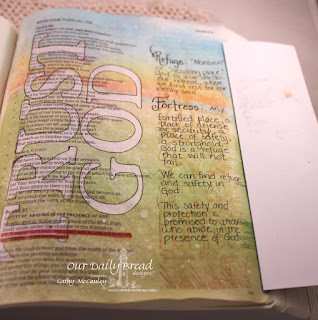 Creative Nugget: My Bible Journal page was prepped with a thin coat of TriArt Clear Gesso. Letter Stencils were adhered to the page with repositional glue dots and Distress Inks were used to sponge over the letters. A Micron pen was used to outline the letters and Art Anthology Gilded Gold Colorations Spray was used to add shimmer to the page. The letter stencils were gently removed from the page. 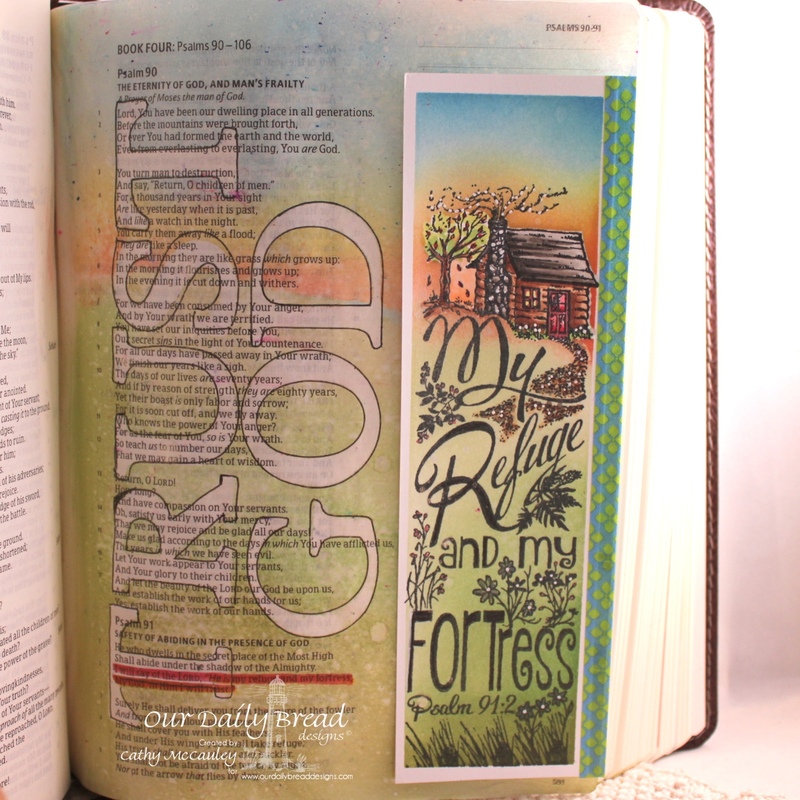 My Refuge was stamped on a piece of Neenah Solar Crest card stock, the cabin and edges were masked, and the same colors used on the Bible page were then sponged on the stamped scene. The cabin and path were colored with Copic Markers and Wink of Stella Markers were used to color the flowers. The Gilded Gold spray was added for shimmer. 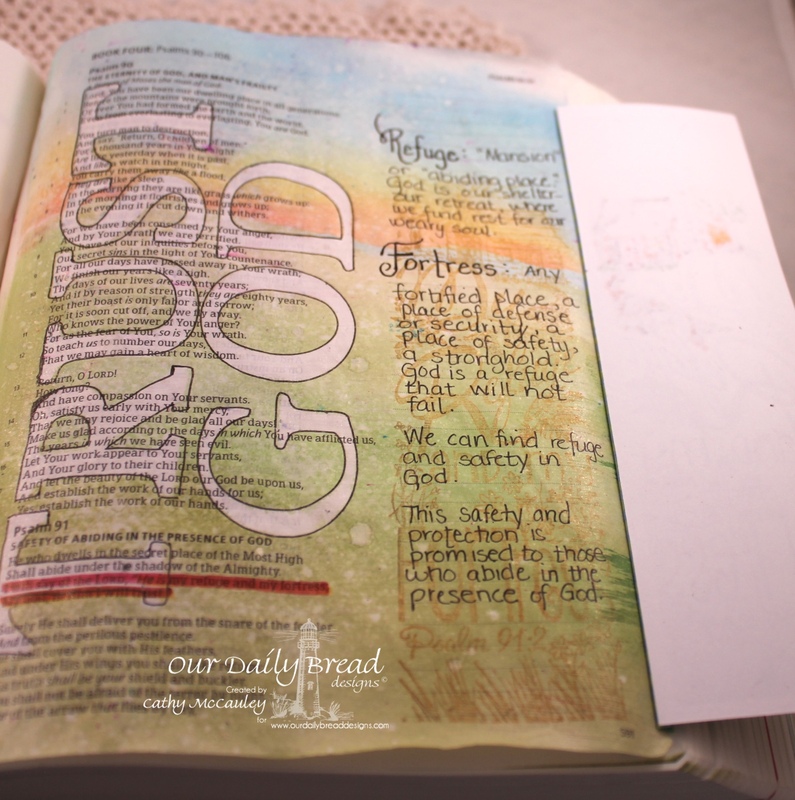 The illustrated verse was attached to the Bible page along the right edge using Washi Tape. This photo shows the shimmer a little better. My Refuge was lightly stamped in the margin of the Bible and notes were written over the image. The Tip-In folds out to reveal the notes taken on the selected scripture verse. 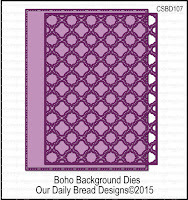 To see all of the breathtaking projects created with the January Release, hop on over to the Our Daily Bread Designs Blog. Then click the links below to see the details for each project. You are sure to be inspired by what you see! While at each blog, be sure to leave a comment to be eligible to win one of the three fabulous prizes!